As a young company launched by two innovative Millennials, we at VERTS seek partnerships that support creatives in our community. One such group is CreativeMornings, a global lecture series that fosters innovation. Recently, CreativeMornings expanded their programs with the addition of FieldTrips, a hands-on experience hosted by local businesses offered to an intimate group of guests. We were honored to be selected to host a CreativeMornings FieldTrip at our first VERTS location off Guadalupe Street here in Austin. Not only is it our first restaurant, it’s home to our test kitchen, where fresh ideas and recipes are incubated before we launch them across multiple restaurants. Upon arrival, guests were greeted by our Event Chef Kate Schirm, who passed around savory Mediterranean donuts. An original recipe created in our VERTS test kitchen, the morning morsel was made of pita dough complimented with a chocolate tahini dipping sauce. After guests settled in, our Vice President of Marketing, Keith Peterson, kicked off the event with a discussion on the evolution of a brand and how we stay inspired in a traditional industry. Keith is no stranger to staying ahead of trends. As the former Global Brand Integration Manager for Red Bull, he headed a multitude of experiential campaigns that drove brand awareness. Next, guests were given an interactive culinary lesson from Chef Kate. 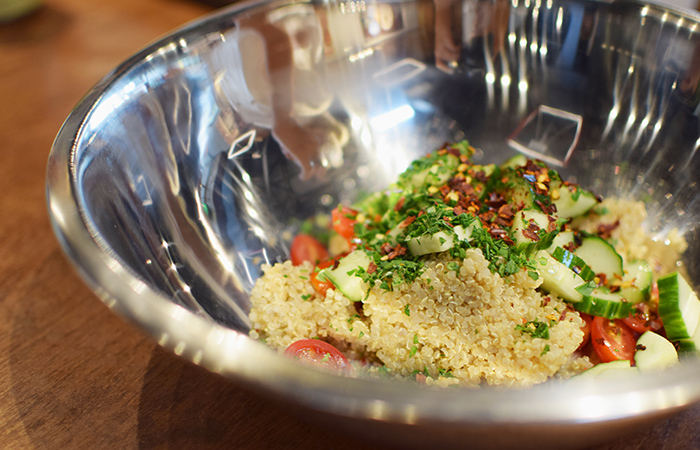 She taught the group how to make fresh Quinoa Tabbouleh. This classic dish is loaded with fresh Mediterranean flavors that is heavy on the taste buds but light on the tummy. This tasty grain (well, it’s actually more of a seed) is always available as a base on our menu. The event wrapped up with a Q&A where Keith and the rest of the VERTS family chimed in on everything from our menu to our digital marketing efforts. As we head into a new year, we look forward to more partnerships like CreativeMornings to support a community that’s been so supportive of us. Want to learn more about CreativeMornings? Reach out to us on Facebook, Twitter, or Instagram! Enter your email address to receive future updates and newsletters from Verts. There seems to be a technical error, please try again later. We apologize for the inconvenience. We’re passionate about passionate people! Want to join a fast-growing company that offers great benefits and growth opportunities? Get special offers on food, receive exclusive rewards, and be the first to hear about new menu additions.